The Googabonga have gone mobile! Based on the uber-popular arcade game, help the Googabonga accomplish what they were born to do: get thrown into the air. This time around, pesky Gooranos have blacked out the suns of nearby planets! 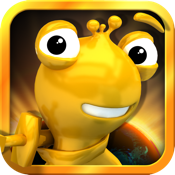 It is the duty of our slimy heroes to travel across the galaxy and bring back light to all inhabitants. Use strategy, precision and the specific powers of each Googabonga to hurl them towards the suns and remove the black goo (eww!) covering them—all while showing the evil Gooranos who is boss! And be careful! UFO’s are on their way to block you AND shoot out more black goo! Enough is enough! Bring the colour back in the sky! -Follow us on Facebook and Twitter!